Ok I think this was discussed before, but is there anyway to start the engraving from center of project? I have cut out a heart shape to fit a chocolate box, and I now want to engrave a name and design inside of the heart. But really no way to do this without me starting in center? Is this possible, or is Easel going to offer this in the future? Thank you for the response, but I think I am lost to what you mean. Sorry I am still a bit of a rookie, only doing basic things. 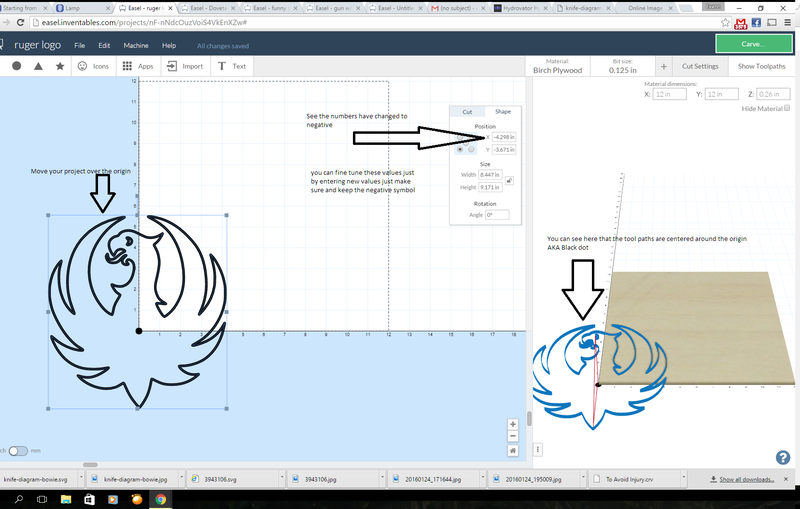 You can visually line your artwork up by using the bounding box handles as they intersect the axes. The center handles are centered in the project, so once they line up with the X and Y axis lines you know you're centered. 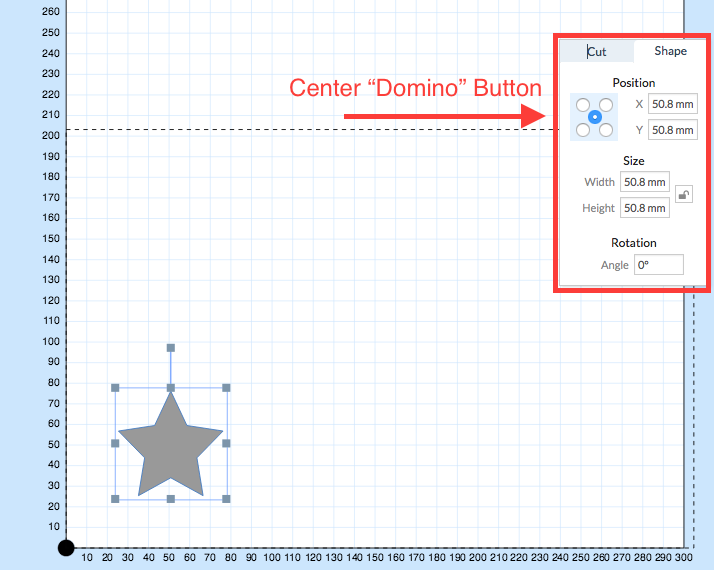 You can also select the center "domino" button, then type 0 for X and Y values, and it will automatically center the artwork on the origin. So, are you saying that aligning the drawing with its center at Easel 0,0 and then setting your spindle to the center of your work piece will make it cut the full item? Seems clunky, but if it works that's all that matters. I like that VCarve allows one to set the work origin where the user wants; i.e., one of the four corners or the center of the work. Yeah. It's a little clunky. 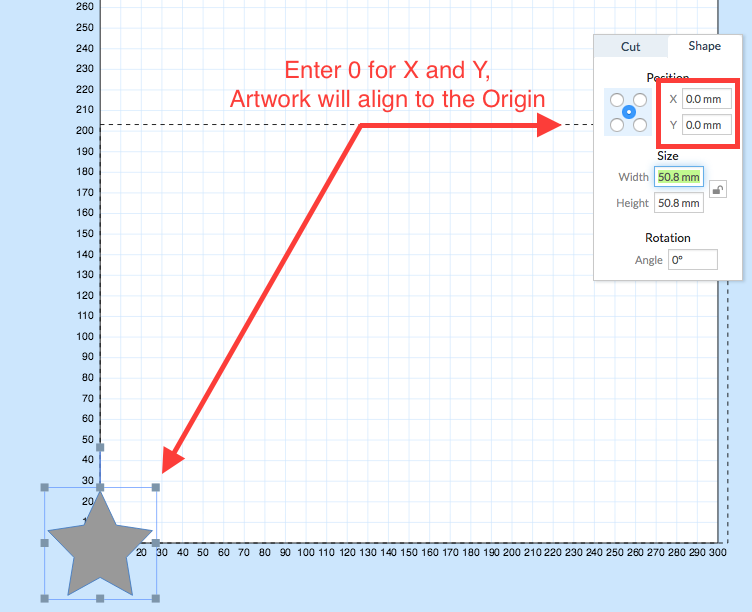 And it's a workaround since Easel won't let us define our own origin points. But as long as you see toolpaths when you hit "show toolpaths" it will cut them. If you want to test it out, go download something like Camotics which will visualize your gcode for you to make sure it is going to cut properly. I have Camotics and use it occasionally. It's a good package for testing. I never thought about trying Easel in the way you describe, but I understand how it will work. Now that I have VCarve, I prefer the way it works, although I do admit to checking out some Easel projects from time to time. Now I think I understand. Origin point is the term I was looking for and to use that arbitrary point is not only clunky but is also quite wasteful. There is not a CNC controller (except Easel) that does that and to do this with no explanation to users that this is so and how to use it is irresponsible. What I think I see here is if I have a 'safe work area' of 10x10 and have a 7x7 work piece placed near center and set what should be point of origin ant the lower left workpiece corner then all xy cuts will be off. Maybe I am just thick but I programed, setup and operated CNC machines for 40 years, point of origin is always (no exceptions) at XYZ zero. The reason for this is simple, one always knows where the tool will cut and can offset accordingly. The need to measure from 'home' position to place the work piece so that the XC can 'find' the correct origin point is foolish to say the least. What I am saying is that this way of locating xy zero makes no sense at all. I went to the easel project I am working on and tried moving the shape around to locate both the lower left corner and center over the machine 'home' and decided not to trust it as it was against everything I know about CNC setup. I have been all around this issue in these forums before with no solid answers. So I started using GWizardEditor to write my Gcode. That works really well for many things but complex shapes like the puzzle shape is a nightmare to code. Much easier to draw it and use a scroll saw.